Bred to Huaycool for a Spring of 2019 cria. Nina had always been one of Niki's all time favorite females. Her presence and style were like no other female we have ever seen and it is for this reason we had to have her. When Nina joined our herd, we knew she was meant to be bred to Eagle. With their temperaments, pedigrees and production histories there was no way we couldn't have an awesome cria from this cross. Niki's only hope was that the baby would be a girl that looked like Eagle..........and it was! 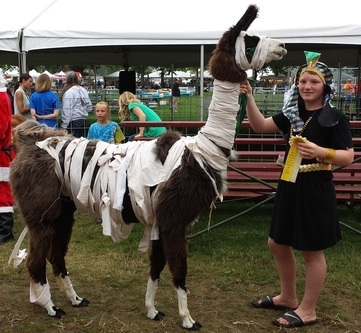 Chantika has Ivory Pond's Aladdin, Bauernheim's Nina, Legend's Rammas and many other llama greats in her pedigree. 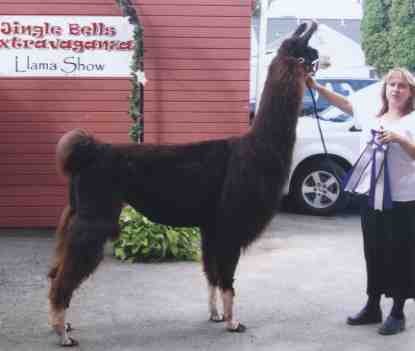 She has a lot of good, but not the run of the mill common llama lines in her pedigree. Chantika is everything we had hoped she would be. She is smart, athletic, tall, elegant and conformational sound. Tika lacks one ALSA grand champion to be an ALSA halter champion and has earned all her ILR halter titles (see above). We have both enjoyed having her here and the barn definitely revolves around "Tika" if you ask her. We waited patiently for Tika to turn four so we could breed her. With several babies on the ground now, we know she has passed her beauty, brains and correctness on to her offspring! Tika is smart as a whip and has done exceptionally well in performance classes prior to having babies. In 2014 she was pulled from breeding to be used for 4H. She won Showmanship and Reserve Grand in Public Relations at state 4H. Tika also did well at our local fair. In 2015 she was used again for 4H (winning Reserve Grand Champion in Showmanship, PR and Grand Champion in Obstacle), but was bred for a Fall 2016 baby. Her name comes from the Starbucks's coffee drink "Chantiko." Tika is part of our keeper herd and will remain here at JNK as a replacement for her dam. Tika has consistenly proven herself as being an all around girl, doing really well in performance. Like most Eagle kids, she took awhile to come into her own and then finishing her halter awards. Tika is a KEEPER in our herd, we love her! Chantika's 2016 Male by Marisco "JNK Marisco's Lucchese"
Chantika's 2013 Male by Huaycool "JNK Huaycool's Presto"
Chantika's 2012 female by Marisco "JNK Marisco's Zela"
Chantika's 2010 male by Marisco "JNK Marisco's Massimo"